You should probably be working right now. That's okay, so should I. 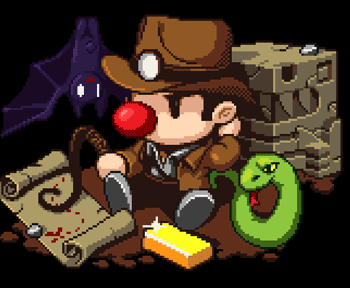 But while you're shirking your responsibilities, why not play an in-browser version of Derek Yu's fiendishly difficult Spelunky that can easily be concealed amongst those TPS reports you're supposed to be writing? The port, made by one Darius Kazemi, is far from perfect. There's no sound, a number of graphical quirks, the dark levels don't live up to their name and Kazemi had to implement a number of quick and dirty hacks to fix major bugs, but overall, not bad for a port that took three hours. If you want to play the full game, sans bugs, you can download it for free here. Or, if you like your graphics shiny and your wallet lighter, you can pick up the well-received 360 port for 1200 MS points.